CHAPTER I: THE COLLECTION FOR CHRISTIANS 1 Corinthians 16: 1-4 ” As regards the collection for the saints, act, also as I directed the churches of Galatia. Each of you, the first day of the week, lay by him in store as God hath prospered, so we do not expect my arrival to collect donations. And when I come, I will send with letters to carry your gift to Jerusalem, the people you approve. If anything deserves me to go also, they shall go with me. ” The early Christians were making collections, not to build buildings prayer but to support the poor. So the collection is to help Christians in need. Thus, in every place where you meet, make collections as ordered by the apostle Paul to help the poor, orphans, widows. 2 Corinthians 8: 1 “We do know brethren, the grace of God which was manifested in the churches of Macedonia through the great test of their affliction. Their overflowing joy and their deep poverty welled up in rich generosity on their part. They, I testify voluntarily given their means and beyond their means, wondering with great insistence grace to participate in the ministry to the saints” We just read 2 Corinthians 8: 1-4, but you can continue on to verse 24, Paul urges to take part in the donation to the saints. 2 Corinthians 9: 1-14 “It is superfluous for me to write to you concerning assistance to the saints, I know indeed, good will, which I boast to the Macedonians, saying that Achaia was ready for last year, and your zeal has stirred the greatest number.” Paul says here that must be given voluntarily, you can continue reading through verse 14. You will see that Paul cites passages from the Old Testament in verse 6 Paul says, “Know, the one who sows sparingly will also reap sparingly, he who sows bountifully will also reap abundantly, in that each gives according to what he has decided in his heart not grudgingly or under compulsion, for God loves a cheerful giver. Proverbs 11: 24-26 . ” He who gives liberally becomes richer, so that the excess savings only get poorer.” The Old and New Testament show that if you give liberally you become richer. Proverbs 19: 17 “He who has pity on the poor lends to the Lord who will reward him according to his works.” So, a Christian should know that him and all his possessions belong to the Eternal, and should think of helping his brothers and sisters as Paul recommends. Hebrews 13: 16 “And do not forget to do good and liberality, as it is with such sacrifices God is well pleased.” A great reward awaits those who will accomplish this word. That is to say that, if you pay the donation, you will have a great reward when Jesus Christ comes, but if you do not, you will have no reward. Christianity does not have to make sacrifices, Paul says that it is the liberal who is his sacrifice. Romans 15: 25-27 “Now I am going to Jerusalem to minister unto the saints.” You can read through verse 27. Collections were very important in the early church, as Paul he moves himself to Jerusalem, as he says himself “serving the saints” We too, must do the same if we have the same mind. Galatians 2: 10 Only they would that we should remember the poor what we I have been careful to do. Paul from Jerusalem to see the apostles Peter and John and expose his Gospel. These are what he taught was good, they advised him only to remember the poor. So a good servant of God should remember the poor. If you are a servant of God and do not give lessons like Peter, Paul, and John James, you are far from the truth. 1 John 3: 17 ” But, whoever has this world’s goods and sees his brother in need and closes his heart against him, how does the love of God remain in him? ” For the apostle John, the new commandment that Jesus gave us is love, and we all agree with him. Whoever has this world’s goods must know that it is God who gave him to help his brothers and sisters and it is not by his own power he possesses. So he must share with others. James 1 : 26-27 “If anyone thinks he is religious, without taking his tongue but deceives his heart, this man ‘s religion is vain, pure and undefiled religion before God and the Father is to visit widows and orphans and widows in their affliction and to keep oneself unspotted from the world . ” James means that a good church should support the orphans and widows. Acts 11 : 27-30 ” In those days, prophets came down from Jerusalem to Antioch, one of them named Agabus stood up and announced that there would be a great famine on earth. It happened in the days of Claudius. The disciples decided to send each, according to his means, a relief to the brothers living in Judea. They did reach the elders by the hands of Barnabas and Saul. We saw several passages which show that early Christians took seriously the appointed support to the saints. We too must do the same, but we see today in the so-called sects or churches, that every day is contributing, and given we do not know what is all this money and where it goes. This is false doctrine. So if you find yourself in a place where a system is not the doctrine of the apostles reign, quickly pull away and return to the apostles’ doctrine. CHAPTER II: VOLUNTARY DONATIONS FOR TEACHERS Galatians 6: 6. “Let him, who is taught the word, share all good things with him who teaches.” After my first book where I said that, Christians should not pay tithe, many people have questions about whether tithing is not paid off to pastors, how do they do to live? We also ask them this question: Peter, Paul, James, John, Timothy and Titus, who have never taken the tithe of the first Christians, so how did they live? The answer is this: They lived with voluntary donations. That is taught convey, to him who teaches. Here it there’s the teacher and the taught. The teacher is not paid off at the end of each month, but he lives with voluntary donations. If the learner has a trade, if it has a field, it will give the teacher his hand, and so on regarding employees, businessmen, factory owners, etc… brief, all categories of workers should share all their property to whoever teaches. So, if you encounter a Christian who understood that tithing does not pay to ask him if he also understood that he must share all good things with him who teaches. If it does not, tell him to do it now. 1 Corinthians 9: 7-14. “Whoever is engaged in an army at his own expense. Which is what plants a vineyard and does not eat the fruit? Who is that which tends a flock and does not drink the milk of the flock? These things I say, do they exist in the ways of men? The law does not as she said for it is written in the law of Moses, Thou shalt not muzzle the ox when it treads out the grain. Does God really care about oxen, rather He speaks only because of us? Yes, it is because of us that it was written that he who plows should plow in hope, and he who must tread the grain with the hope of partaking. If we have sown unto you spiritual things, is it a great thing if we shall reap your carnal things? ” Paul wrote the letter to the Corinthians about the year 56 AD when he was in Ephesus. Some Corinthians accused him not to be an apostle, others that it is low. Paul also refuses he take their property because they were carnal Christians. They forgot that it was Paul who established the church. Chapter 9:1, Paul asks the Corinthians if not an apostle. In verse 14, Paul says something important “just as the Lord has commanded that those who preach the gospel should live of the gospel.” So if we live the gospel we do not commit sin, because it is a recommendation of the Eternal. 2 Corinthians 11: 8-9. “I robbed other churches, receiving wages from them to serve you. And when I was at home and found myself in need, I have been a burden to anyone, for the brothers who came from Macedonia supplied what I was missing. In all things, I have kept myself from being burdensome to you, and I will keep myself. ” Paul here prefers taking Macedonian donations instead of Corinthians’, because they did not understand. These are people full of pride, they do not know that it was through Paul that the word of salvation came home. They began to accuse and judge. Paul says in 1 Corinthians 4:18 that their “some are puffed up with pride as if, I should not go home. But I will go home soon, if the Lord wills Paul said, I will see if it is the will of God, for the kingdom of God is not in word but in power and will know not the words, but the power of those who are puffed up. ” 2 Corinthians 10: 7. “You look ! If someone is convinced he is Christ’s , let him say good in himself, as he is Christ’s, even so are we Christ’s.” Here the brothers who live in ignorance, they are at home, Paul brought them salvation, instead of allying behind to work, they are deceived by the devil and pride to be saved and even go up ‘to deny the apostleship of Paul, or Paul’s apostleship was confirmed by God and men. Paul also refuses to take their donations. Some ignorant people cite daily 2 Thessalonians 3: 6-8 stating that Paul himself says here you eat bread from anyone. But who are the Thessalonians? Paul wrote this letter in the year 51, Paul is how long he Thessaloniki? According to Acts 17: 1, three weeks, that is to say 21 days, and he left the city because of the persecution. If put longer, he would have taken their gifts since the Christians of Thessalonica are not those come from Corinth. You can see that as he did not last in Thessaloniki, he had not yet finished eating what he brought Thyatira (Acts 16: 13) when he had to leave the city because of the persecution. Brothers and sisters! We urge you to make voluntary donations to the one who teaches you according to 1 Corinthians 9: 15, Paul even says that it is a right thing. Philippians 4: 18. We have seen that the Philippians sent donations to Paul because they recognized his ministry, they are not rebels as the Corinthians. 1 Timothy 6: 17. Paul told Timothy to recommend to the rich of this century not to be proud and, not to put their hope in uncertain riches, but in the living God. We want to awaken the conscience of the rich brothers and sisters among us to put their hope in God, because if they put it out of God, the Bible says in Revelation 13: 17 “The day comes when you cannot buy or sell without the mark of the beast.” So, you need to do the Lord’s work with your money and do not place it in the banks. This is why our Lord Jesus Christ, seeing what will happen, namely the mark of the beast, he said in Matthew 3: 19 “Do not lay up for yourselves treasure on earth or moth and roils destroy and where thieves break in and steal, but lay up for yourselves treasures in heaven where moth and rust doth corrupt and where thieves do not break through nor steal: for where your treasure is, there will your heart “. What are moth and rust? This is the antichrist, that is to say the beast. Who is the thief, always him. You should know that we are in the last days, and that antichrist is coming soon. Do not say, you do not see, prepare yourself, take care and put your money at the disposal of the Lord’s work. You will not lose your reward. That is why Jesus Christ said in Luke 16: 9 that we need to make friends with the unjust property they receive us into everlasting habitations when they come to be missed. If therefore, ye have not been faithful in the unrighteous mammon, who will entrust the true. The real wealth that God gives us is the Holy Spirit who can neither perish nor be destroyed or be stolen. But the unrighteous riches are the riches of this world pass, you must also put your treasure in Heaven, that is to say, God, for where your treasure is, there will your heart. Acts 28: 8 -10. Paul did not refuse donations in all cities where he went. We saw that he prayed and God healed many patients. It has also made ​​their donations they have accepted. But as in Corinth accused of false brethren, he refused their gifts. Philemon 2: 2. Paul tells Philemon to prepare him a home when he comes to visit him, because he knew that Philemon had understood what concerned the reward spoken of the Lord in Matthew 10: 41-42. In conclusion, the collection for Christian ministers and voluntary donations have a great reward. May God help us to put this into practice in the name of our Lord Jesus Christ! CHAPTER III: THE FIVE DEPARTMENTS Today, disarray about five departments. So we wanted to shed light on this point Based on the doctrine of the apostles. Ephesians 4 : 11. ” And he gave some as apostles, others as prophets, others as evangelists, others as pastors and teachers ” 1 / What is an Apostle? This is the one that lays the foundation. Here we are told that he gave some as apostles, that is to say that, it is a ministry and not a title. Today, we see the so called apostles, that is to say people who take the title but not, the ministry. An apostle is someone who is not fixed in one place but that goes from town to town and from country to country to lay the foundation. Or as the foundation has already been laid by 1 Corinthians 3: 10, there are more founding apostles today, but may have apostles builders. The founders are Peter and Paul , we, the apostles of the last times, the builders. So, if someone is sitting in a city where he directs one or more churches, it is not an apostle. Show me in the Bible where there’s been someone directing one or more meetings in the same city and called apostle. 2 Corinthians 11: 13. “These men are false apostles, deceitful workmen, masquerading as apostles of Christ.” 2 / What is a Prophet? Today we see the false prophets who prophesy that all the prosperity and the physical and material blessings. They are not in the apostles’ doctrine. We can no longer call someone a prophet, but rather someone with the gift of prophecy. There are currently more than founding prophets as the foundation has already been laid according to Ephesians 2: 20 “You have been built on the foundation of the apostles and prophets. So we see that the apostles and prophets are the founders Actes15 : 32 ” Judas and Silas who were themselves prophets exhorted the brethren with many words”. The prophet is not fixed in one place. Now, there are more but founding prophets and prophets builders. So, if you are in a place and someone says apostle or prophet, if built on the foundation of the apostles and prophets of the New Testament to know Christ or it is another foundation check . Otherwise get out of there fast! 3 / What is an Evangelist? The evangelist is working under the command of the apostle as Timothy, Titus and Philip. It also makes international work but now, we see that it is a shepherd who lays the Evangelist. However, according to the order established by, the evangelist is more important than the Shepherd. If you are in a place where it is the pastor who established the Evangelist, quickly leave this place because it is false that you taught. His role is to bring the good news to unbelievers and sinners. 4 / What is a Pastor? The word pastor is once in the Bible (Ephesians 4: 11). In fact pastor, elder, bishop mean the same thing. This is the apostle and evangelist who established the former bishop or pastor. Today we notice that there are people who get up and give the title of pastor without an apostle or evangelist has established. This is false.The pastor is responsible for ensuring the church that the apostle or the evangelist has left his hands (Acts 20: 17-29). To be a pastor or bishop and elder, it is a call, we are not going to Bible school to be a pastor. I assure you that all those who have become pastors with a degree from a Bible school, are pastors of men, but not God. Because in the Bible, nobody never became pastor by going to a Bible school. In Genesis 2: 15, the Lord took Adam and placed him in the Garden of Eden . In Genesis 6: 13, it is God told Noah to build an ark. In Genesis 12: 1, it is God who called Abraham to leave his father’s house. In Exodus 3: 10 that God sends Moses to speak to Pharaoh. In Malachi 3: 1, it is God who sends John the Baptist to prepare the way for Christ. Luke 6: 13, 1 Peter 1: 1, Peter was the apostle of Jesus Christ, for he was called. Acts 9: 15, Galatians 1: 1, Paul was an apostle of Jesus Christ and not by men. Have you, in the bible, seen someone who is proclaimed man of God without a call from God? No! 5 / What is a Doctor? This is a teacher, Romans 12: 6, ” He who has the gift of teaching is in his teaching.” In 1 corinthians14: 25, Paul calls instruction. But in reality all five ministers teach. An apostle can simultaneously be as elder as John ( 2 John 1: 1) or Peter ( 1 Peter 5: 1) and James (Acts 21: 17). CHAPTER IV: LAYING ON OF HANDS We believe that, those whom God has called to be apostles, prophets, evangelists, pastors, teachers must receive the laying on of hands before starting work. Today, men who say they are apostles, prophets, evangelists, pastors, and teachers, without the laying on of hands we notice. But the laying on of hands should follow the call and must be done according to biblical principles. There are three charges of hands: The laying on of hands to recommend yourself to God, that is to say, to choose someone as pastor, deacon, apostle, or evangelist. The laying on of hands to someone who is sick for healing. The laying on of hands to someone else to receive the gift of the Holy Spirit. The laying on of hands for the call. Take the example of the Apostle Paul in Acts 13: 3 “After they had fasted and prayed, they laid hands on them and sent them off.” Thus, the choice of pastors: Acts 14: 23, “they nominated elders in every church. After having prayed with fasting, they commended them to the Lord in whom they had believed.” And, in Titus 1: 5, Paul told Titus to establish elders in every cities. For the choice of deacons, Acts 6: 6. “They set before the apostles who prayed after their laying on of hands. All these passages we have read show that the apostles, elders and deacons did not live in disorder, but followed established rules. Contrary to what is happening today. So, if someone says pastor, ask him which apostle called by God as Paul, laid hands on him. The great Paul himself, received the laying on of hands by the other apostles. Yet, ask evangelist commissioned by an apostle as Paul instructed Titus (Titus 1: 5) has laid hands on him. May God help you to return to the apostles’ doctrine. The laying on of hands on the sick Mark 16 : 17. “These signs will accompany those who believe: In my name they will cast out demons, they will speak with new tongues , they shall take up serpents and if they drink any deadly thing , it will do them no harm , they will lay hands on the sick , and the sick will be healed . ” The laying on of hands on the sick can be made by all those who believe. Jesus Christ did not reserve it to a class of people. The laying on of hands to receive the Holy Spirit No man today has the right to lay hands on someone to receive the Holy Spirit. It was reserved only for the apostle Peter, the apostle of the Jews and the Apostle Paul, who is the apostle of the Gentiles. Today, we see people who try to imitate and deceive others by telling them they give them the Holy Spirit. This is false, Peter had been laying on of hands once during his ministry ( Acts 8: 14). The apostles which were at Jerusalem heard that the Samaritans believed in the word of God, they sent Peter and John. They arrived at the Samaritans, prayed for them that they might receive the Holy Spirit, because He had not yet fallen on any of them, only they were baptized in the Name of the Lord Jesus. Then, Peter and John laid hands on them and they received the Holy Spirit. God wanted to confirm to him that he was the apostle to the Jews. This has happened only once in the ministry of Peter. Acts 19: 6 ” And when Paul had laid hands on them, the Holy Ghost came on them.” God also wanted thereby, to confirm that Paul was the apostle of the Gentiles. This confusion in Acts 9: 17, ” Ananias went and he came into the house, he laid his hands on Saul and said, Saul, the Lord Jesus who appeared to you on the road by which you came sent me, so that you may regain your sight and be filled with the Holy Spirit. ” Acts 9: 18, ” at the same time they fell from her eyes as it were scales, and he received his sight and was baptized.” Paul says in Galatians 3:1-5 that the Holy Spirit is received by faith, so you false pastors, false prophets, false teachers who deceive people by flattering; you give them the Holy Spirit.., who gave you this power? Timothy, Philip, Titus did not even have this power, it is Peter and Paul who had it, therefore, repent and return to the apostles’ doctrine. God help you to do it! Si vous lisez encore hebreux 7:8-9,12,18 tout homme honnete compendra que la dime n’est plus recommende dans le nouveau testament. Avec toutes les references que vous avez donnees. Tout le chapitre a comme sujet: melchisedek, la dime et le sacerdoce des levis. Au verset 18 paul dit le sacerdoce etant change la lol aussi a changee. Pour ce qui concerne la charite pour les pauvres et orphelins Malheuresement on ne peut plus trouver une telle eglise sur la terre . 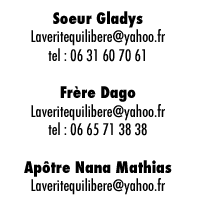 Vous avez conseille aux gens de quiter l’eglise qui ne pratique pas cela, pour Aller ou ? Toutes les eglises ne sont que des enterprises privies et non l’oeuvre de jesus christ.